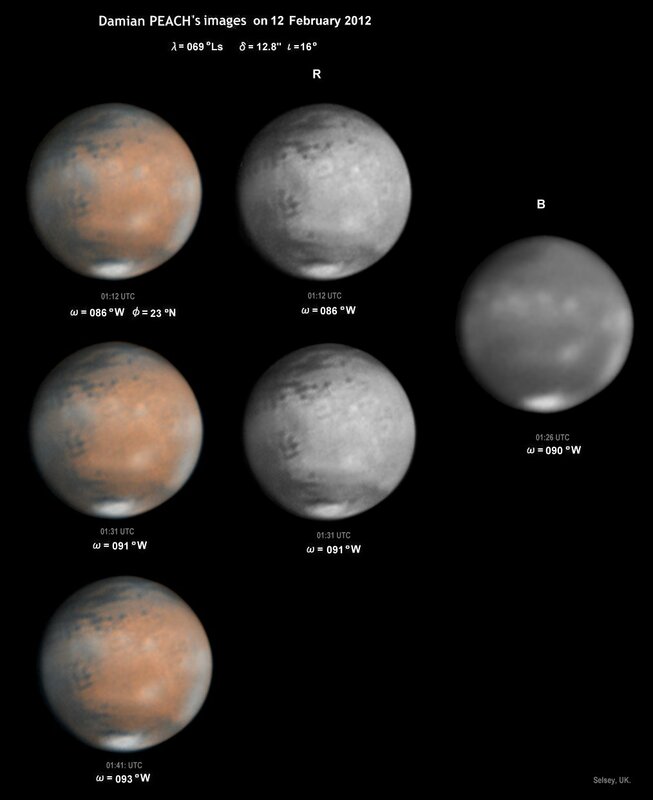 Alert on 15 May: Another possibility of mushroom-like protrusion from Martian terminator at dawn : According to the spaceweather. 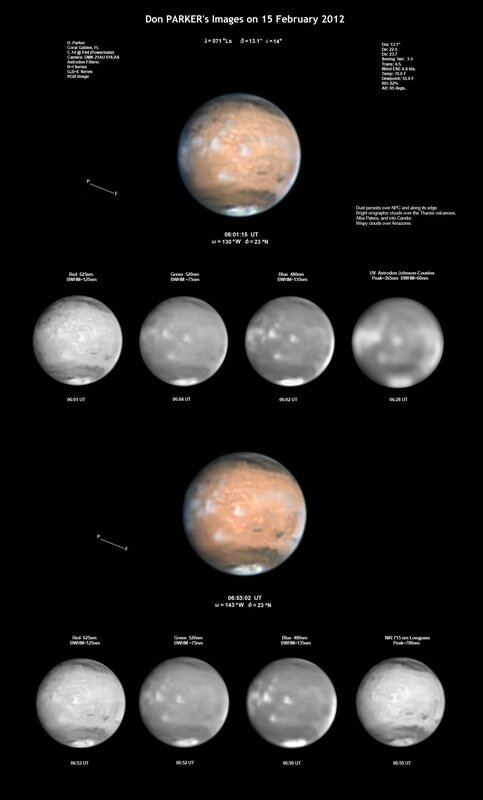 com, a large CME may pass the planet Mars around on 17 May. Be cautious around from 20 May at the dawn terminator. Gallery Watching on 02 May: Bill FLANAGAN Captured the New Protrusion: On 25 April Bill FLANAGAN, TX, found a rising a Mushroom protrusion near the place as Wayne JAESCHKE discovered earlier. Gif moving image is also associated. 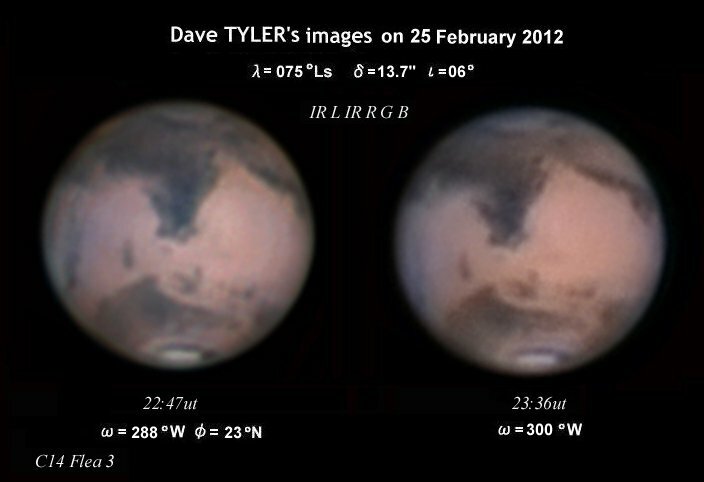 Alert on 31 March: Possibility of another auroral-like protrusion from Martian terminator at dawn : Since AR #1429 emitted another CME on 26 March there is a possibility that someone may be able to capture an auroral-like protrusion from the morning limb as Wayne JAESCHKE did on 20 March (http://exosky.net/exosky/?p=1606). and it is suggestive to refer to the "Expectation Time Table" given by Masami MURAKAMI at LtE Now on 29 March. See also Wayne's LtE on 26 March for informative suggestion. We considered that this was because of the activity of the Sun at that time (see the Appendix of the above Web Site), and that the Solar Wind worked on the strong magnetic fields at the region of Ausonia-Hellas. The present place is not so far from the thick region. At present we don't know any particular Sun activity. Or do you think the meteor impacts are fond of the similar place to drop? Gallery Watching on 20 March: Dust-Fall inside Hellas? As expected, Hellas has become whitish bright at this season. However there looks to exist a broad rift inside, and this seems to be related with a (southern) polar dust. The broad rift is seen on MORALES (EMr)'s images on 5 March (λ=079°Ls) at ω=295°W as well as on 6 March (λ=079°Ls) on GORCZYNSKI (PGc)'s at ω=283°W, on EMr 's at ω=285°W and on WALKER (SWk)'s at ω=290°W. 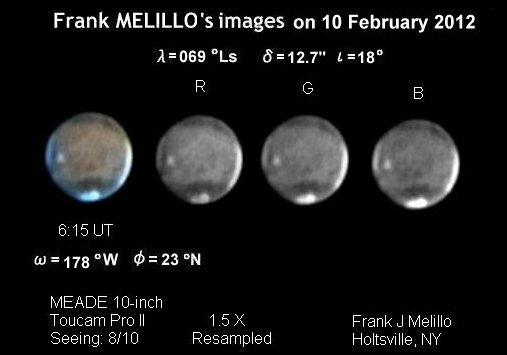 See also FLANAGAN (WFl)'s images on 6 March (λ=079°Ls) at ω=308°W, ω=313°W, ω=318°W where a peripheral dust streak outside Hellas looks to exist. 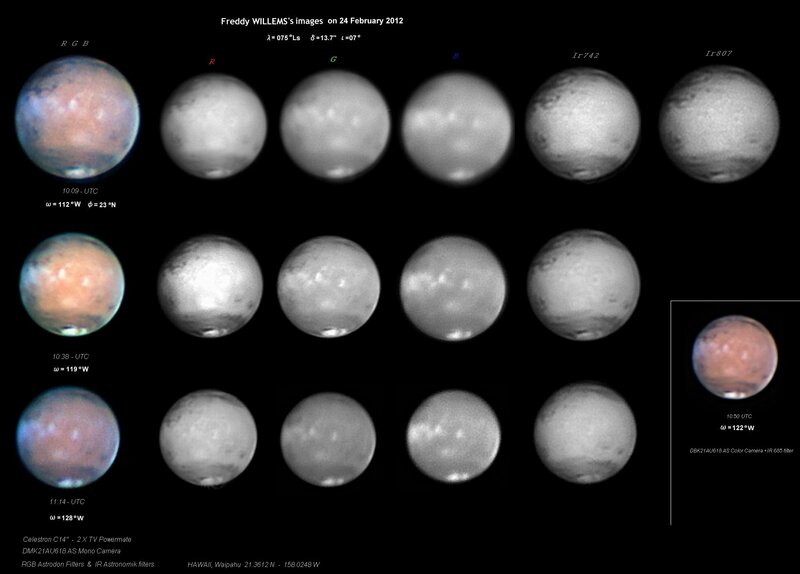 Finally WESLEY (AWs)'s image on 19 March (λ=085°Ls) at ω=313°W, which is comparable with WFl's, seems to show the dust fallout inside and outside (rather vast) of Hellas at the same time. Gallery Watching on 8 March: CMT of Olympus Mons plus Sources of the Polar Dusts: 1) The CMT of Olympus Mons when the planet was near at opposition was observable in Japan and Oceania, and in fact Reiichi KONNAÏ (Kn) succeeded visually in determining the position of Olympus Mons or its cloud over the following flank at Ω=135°W on 1 March (λ=077°Ls). In general the weather this winter in Japan has been quite dismal, and for instance at Fukui we tried three times on 24 Feb, 3 Mar and 7 Mar, but we could not capture Olympus Mons visually because of the poor seeing; it also says that Olympus Mons did not shine (at Fukui however we succeeded in 1997: click here and see NB). 2) On 22 February (λ=074°Ls) Don PARKER (DPk) produced an excellent and precious set of images at ω=036°W: It showed that Chasma Boreale was full of dust to the extent that the presence of Chasma Boreale looks very faint ( Damian PEACH (DPc) also faintly showed Chasma Boreale on the same day at ω=024°W as has been remarked on 25 February below). 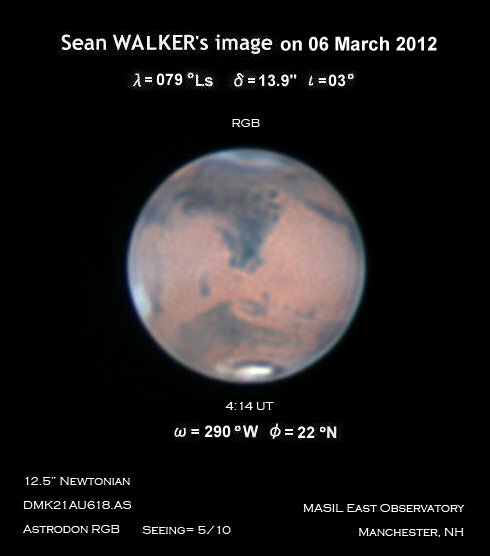 This is also apparent on Sean WALKER (SWk) & DPk 's image at ω=036°W. The dust was already present as was captured by Efrain MORALES (EMr) the day before on 21 February (λ=073°Ls) at ω=088°W: This set of images is interesting since it is suggestive that the second rhs rift on SWk & DPk's images is related with the large inlet associated with Rima Borealis which lies opposite to Chasma Boreale, while at present the npc is completely inside the disc. Bill FLANAGAN (WFl)'s sets of images on 26 February (λ=076°Ls) at ω=041°W, 051°W are also suggestive and will support this idea (unfortunately 051°W, 061°W, 071°W, 081°W ....are missing). 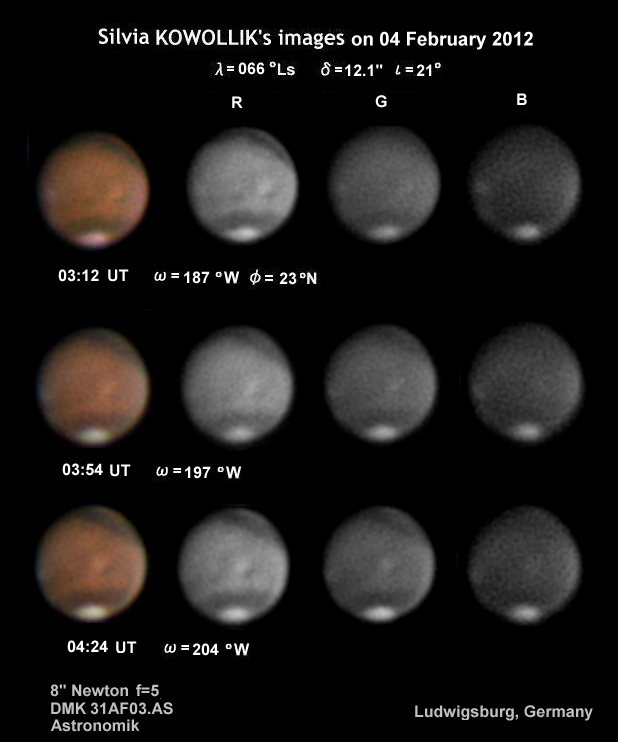 WFl's images show that the dust at Chasma Boreale largely expands toward the area of M Acidalium getting beyond Hyperboreus L. Freddy WILLEMS (FWl)'s set of images on 3 March (λ=078°Ls) at ω=041°W proves that it expanded further (it is interesting to compare FWl's images at ω=041°W with the preceding WFl's image set at ω=041°W). 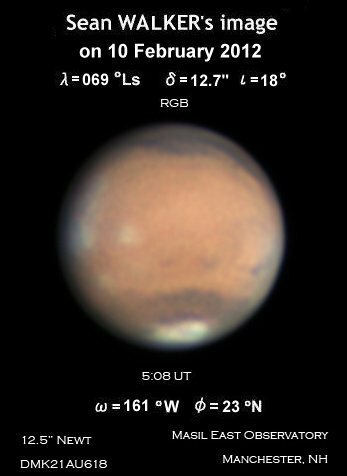 3) We additionally note that Marc DELCROIX (MDc)'s set of images on 1 March (λ=078°Ls) at ω=258°W also suggests that another dust expansion exists largely outside the opposite area of the npc. It is possible that the several inlets of the outside and the inside of the P-ring are the sources of the polar dusts (the inside of the P-ring is the residual cap). 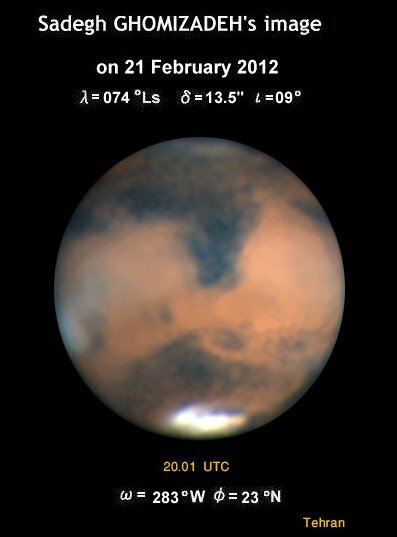 Gallery Watching on 1 March: Some Remarks: 1) The dust "storm" suggested by TYLER (DTy) associated with his RGB image on 20 Feb (λ=073°Ls) at ω=019°W was denied by the image of EDWARDS (PEd) on 25 Feb (λ=075°Ls) at ω=293°W and DTy's images on the day at ω=288°W at ω=300°W. 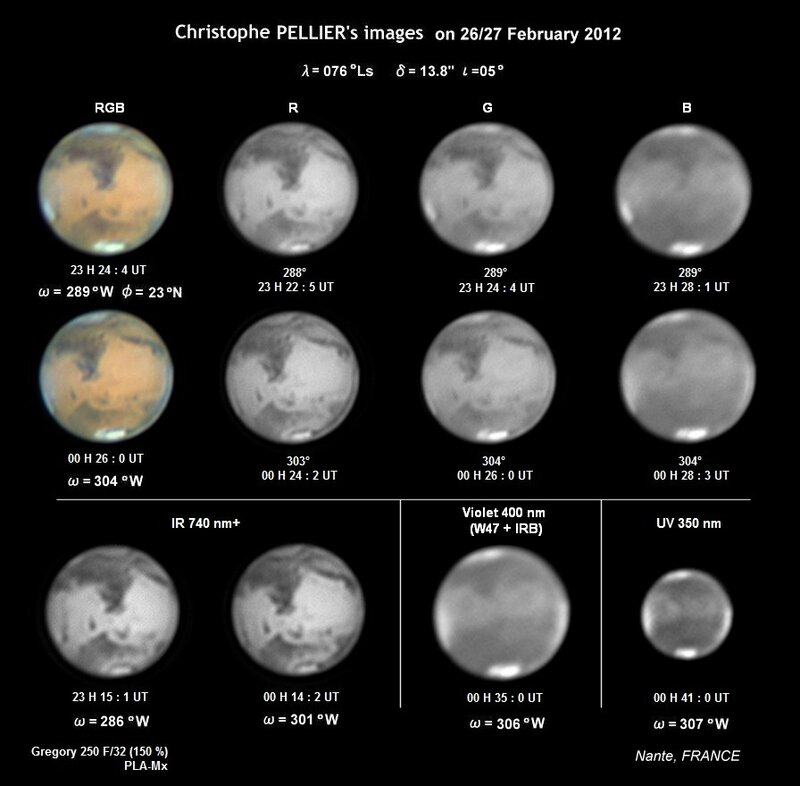 However Hellas was duller on the latter compared with the one by PELLIER (CPl) on 26 Feb (λ=076°Ls) at ω=289°W which shows rather bright Hellas, and hence some dusty air must have been floating (thickly near at the terminator). 2) Chasma Boreale was for instance captured by FLANAGAN (WFl) on 26 Feb (λ=076°Ls) and by some others: It is easily seen because Chasma Boreale runs into Hyperboreus L. Recently the obsolete and dead nomenclature Rima Tenuis resurrected, but it's a kind of nostalgia. (SCHIAPARELLI's Rima Tenuis - named by ANTONIADI - is independent of Hyperboreus L.) The residual cap is now bared of the covering ice and there is no room to show up any new definite rift (see EAS Mars Express image on 15 Feb). 3) There obtained a lot of "blue Syrtis Mj" but it should be remembered that Syrtis Mj is not really blue nor the "blue cloud" is covering. So "Syrtis blue cloud" is a misnomer. It should be understood à la KONNAÏ (Kn) as "Bluish optical tint of peripheral (white) mist/cloud standing out against the dark background of Syrtis Mj". 4) Similarly, EBC or ECB gives misunderstandings. It is really faintly seen in B but scarcely in R, so that it is not the usual Cloud. 5) Olympia is now apparent, but it should be remembered that DOLLFUS polar map shows at the both sides of Olympia two isolated detachments accompanying; at the eastern side Ierne, and at the following western side an anonymous ice-island. So it should be watched carefully for a while. 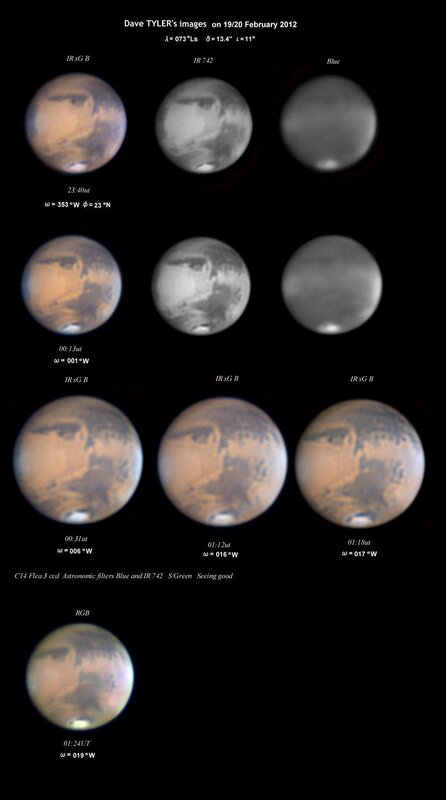 6) Olympus Mons does not shine despite the opposition time; this must be because of the seasonal cloud over Mons. 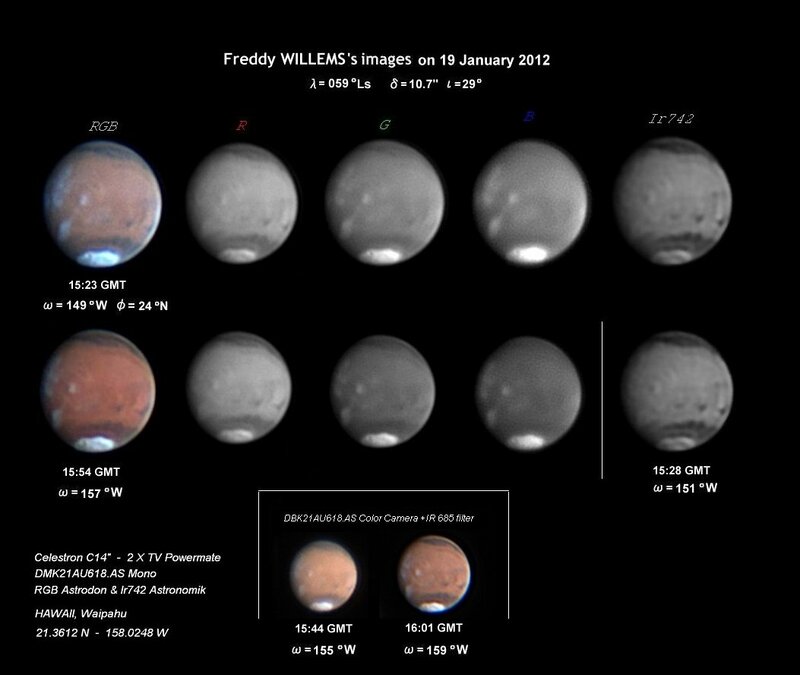 On WILLEMS (FWl)'s images on 24 Feb (λ=075°Ls, ι=7°) at ω=112°W in RGB, Olympus Mons at the morning side shows some structure including a dark spot. Opposition is ahead. 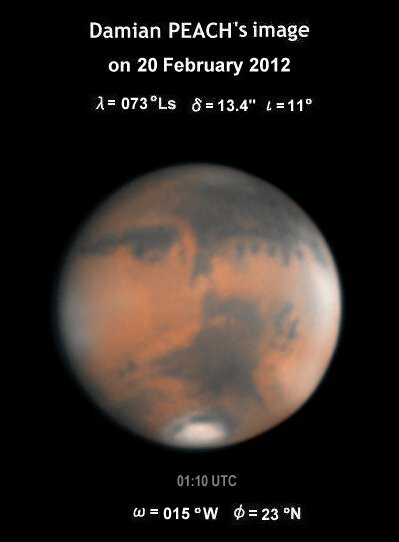 Gallery Watching on 26 February: Tharsis Torio Stuck out of the Lower Mist: Tharsis three volcanoes looked poked out from the lower morning mist on the images of GORCZYNSKI (PGc) made on 21 Feb (λ=073°Ls) at ω=069°W (submitted just today at 18:57GMT). 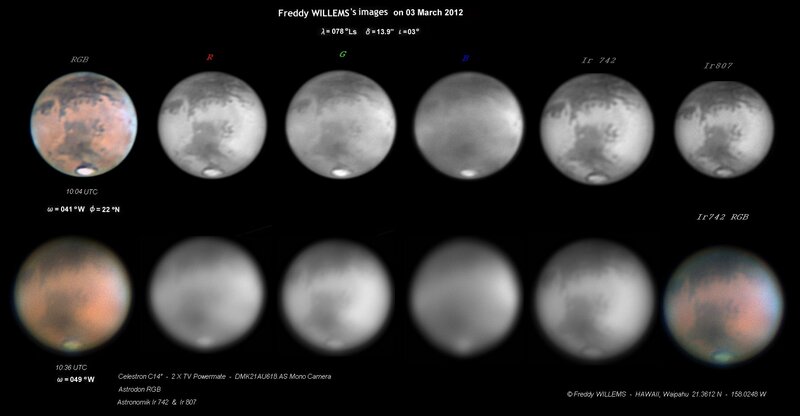 As well MORALES (EMr)'s set of images on 22 Feb (λ=074°Ls) at ω=063°W also shows them more sharply. There are of course other images which show part of separated volcanoes (for example, EMr's images on 23 Feb (λ=074°Ls) at ω=047°W, PGc's on 21 Feb (λ=073°Ls) at ω=056°W, J.-J. POUPEAU (JPp)'s on 19 Feb (λ=072°Ls) at ω=042°W, etc). 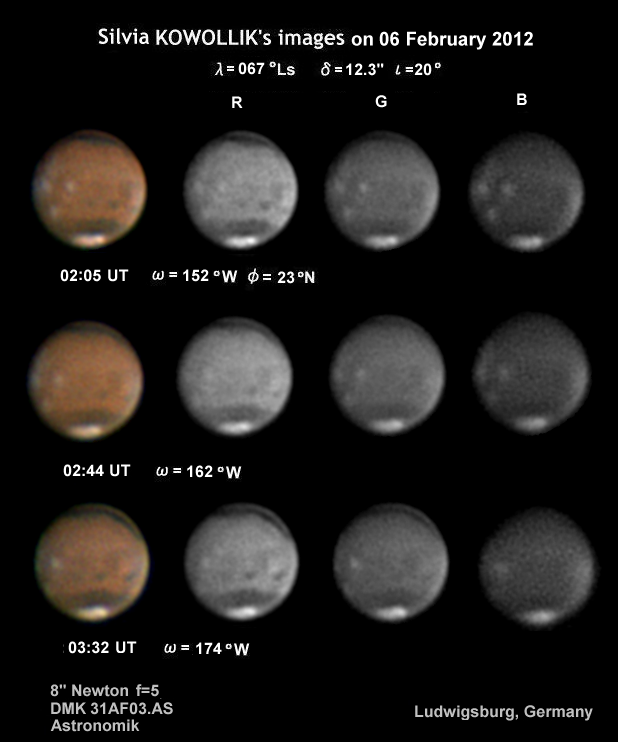 As to the dark point of Olympus Mons, it is peculiarly isolated by a surrounding roundish mist as seen on EMr's images on 21 Feb (λ=073°Ls) at ω=088°W and 19 Feb (λ=073°Ls) at ω=090°W as well as on the PARKER (DPk)'s images on 20 Feb (λ=073°Ls) at ω=094°W. This may be a precursory state of the orographic cloud. 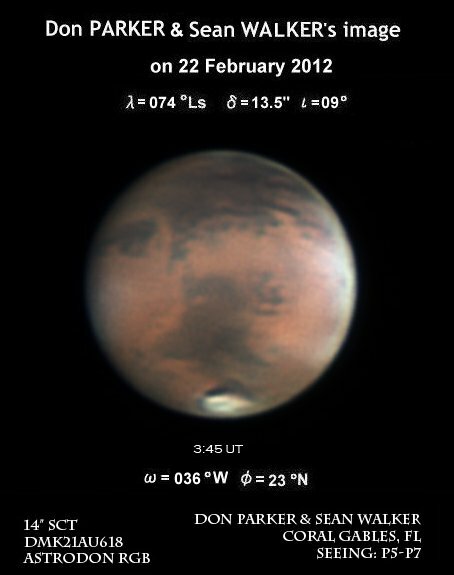 Of course Olympus Mons is not isolated quite early morning as on EMr's on 22 Feb (λ=074°Ls) at ω=063°W. 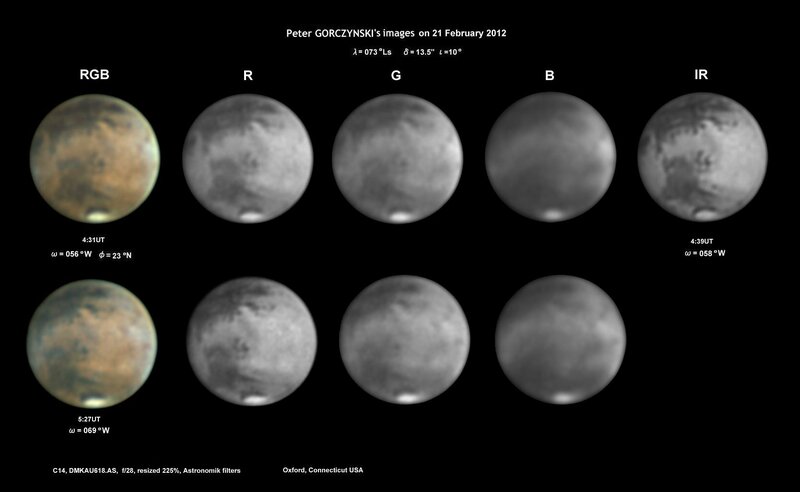 Gallery Watching on 25 February: Chasma Boreale : The most recent MRO MERCI Weather Report (22 Feb 2012) faintly shows a fine segment of Chasma Boreale, while already Damian PEACH (DPc)'s excellent image made on 20 Feb 2012 (λ=073°Ls) at ω=015°W looks to show the presence of Chasma Boreale. 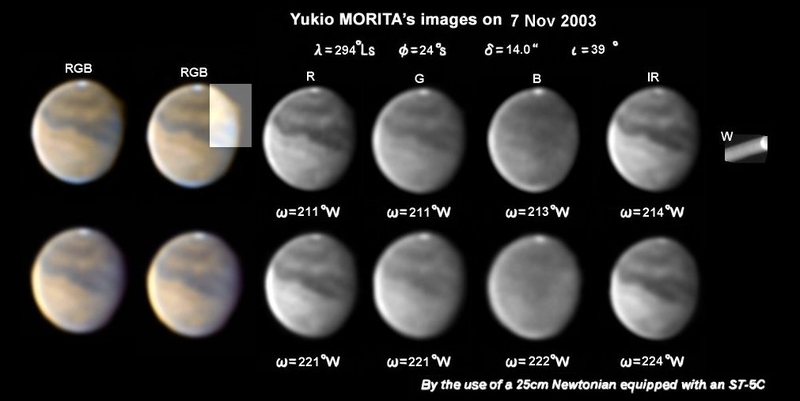 His set of images on 22 Feb 2012 (λ=074°Ls) at ω=024°W also suggests the presence: This set shows at the same time at the opposite limb a bit of a frosty crater of Argyre, as pointed out by Reiichi KONNAÏ (Kn) (in the Japanese LtE Now on 24 Feb - See also his English LtE on 2 Feb). Gallery Watching on 24 February: Olympia : The first sight of the western end of Olympia was captured by GHOMIZADEH (SGh) on 21 Feb (λ=074°Ls) at ω=283°W. Olympia extends in ANTONIADI from Ω=240°W to 170°W while on DOLLFUS Map at the season λ=108°Ls its width is from about Ω=280°W to 200°W while Deucalidonius L is from Ω=200°W to 170°W. The eastern end of Olympia at present can be seen from excellent images of MORALES (EMr) on 11 Feb (λ= 069°Ls), 12 Feb (λ= 069°Ls ), 16 Feb (λ= 071°Ls ), as well as of PARKER (DPk) on 15 Feb (λ=071°Ls ), and it may be fixed at around Ω=170°W~200°W depending on the dust movement around there. (Deucalidonius L may be caused by the dust disturbance every year.) 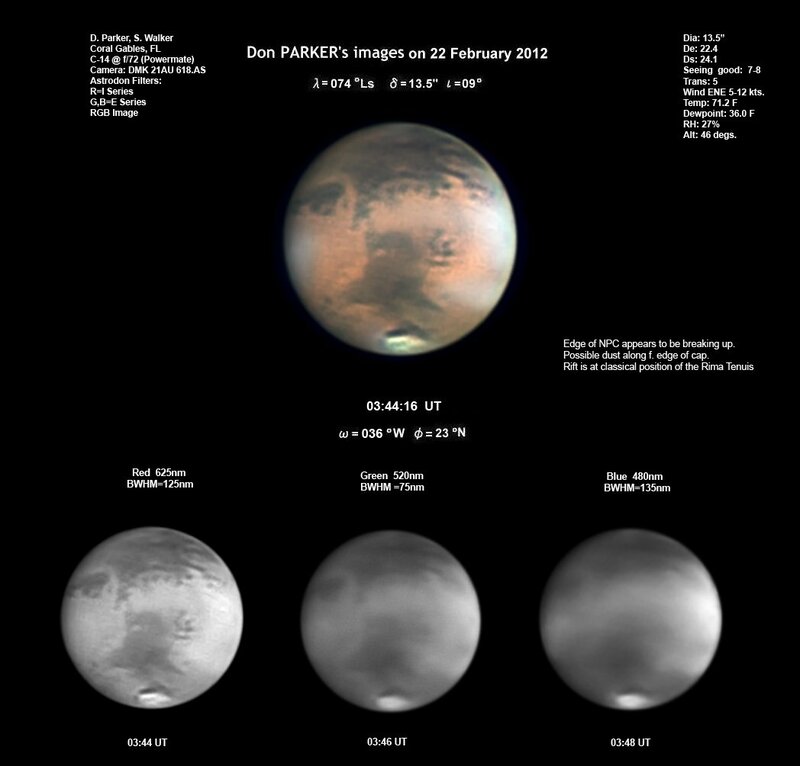 The dust is largely expanding to the Vastitas Borealis. Rima Borealis is, as aforementioned, apparent already on the images of EMr on 2 Feb (λ= 065°Ls) at ω=247°W: this RGB shows that the residual cap was already dirty (reddish). 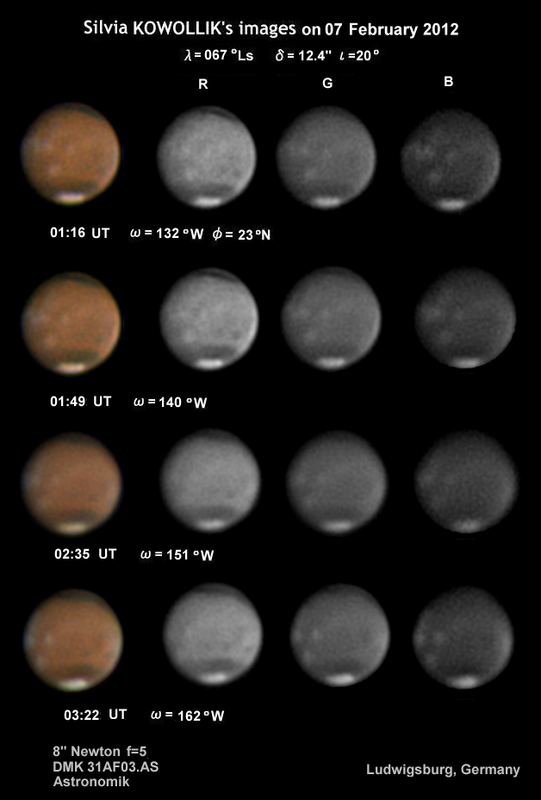 Gallery Watching on 15 February: from 5 February to 12 February : Upto the present time, Efrain MORALES (EMr)'s images on 11 Feb (λ=069°Ls) at ω=173°W (06:30 GMT) are the best concerning the dust streak at the outer ring of the npc. 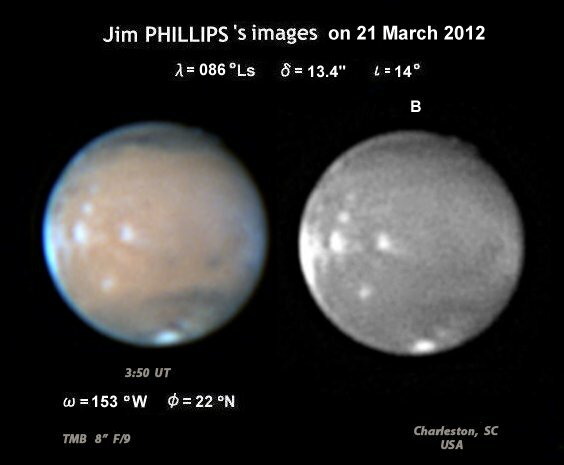 To take a similar image on the following day he should have made a shot at 40 minutes later at 7:10 GMT because the rotation period of Mars is longer by about 40 minutes. However he took at 6:12 GMT (ω=159°W). 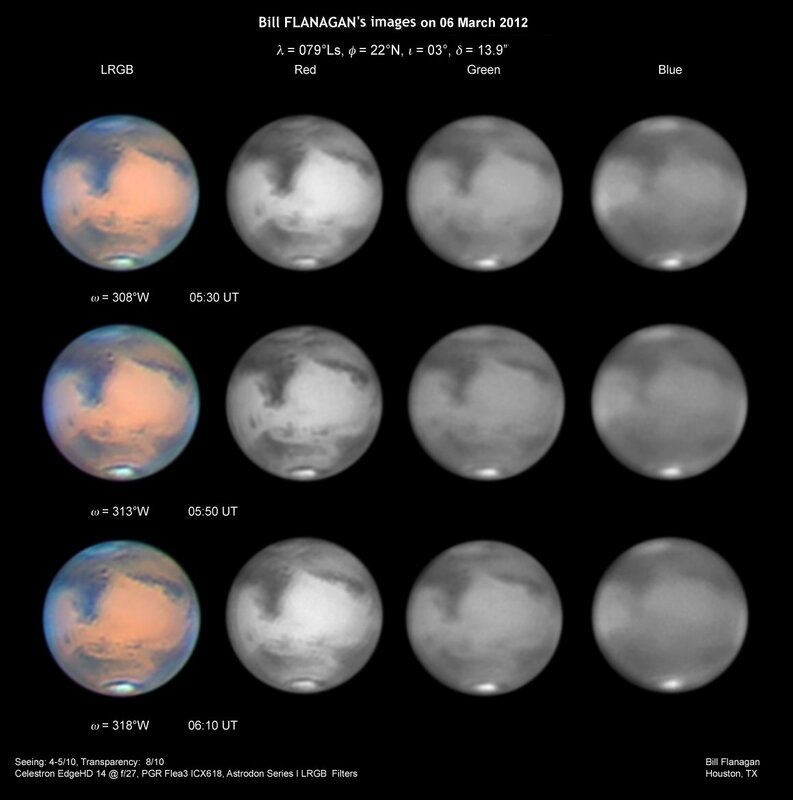 Fortunately however Silvia KOWOLLIK (SKw) made images at ω=152°W, 162°W, 172°W on 6 Feb (λ=067°Ls), and they all show a precursory state of the same dust at the similar position. 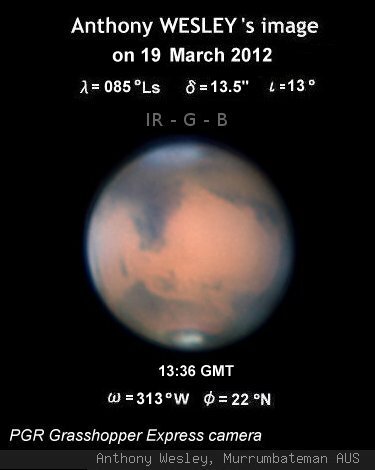 As far as we see, her sets of images on 5 Feb (λ=066°Ls) at ω=171°W, 186°W, 192°W also suggest the dust presence. 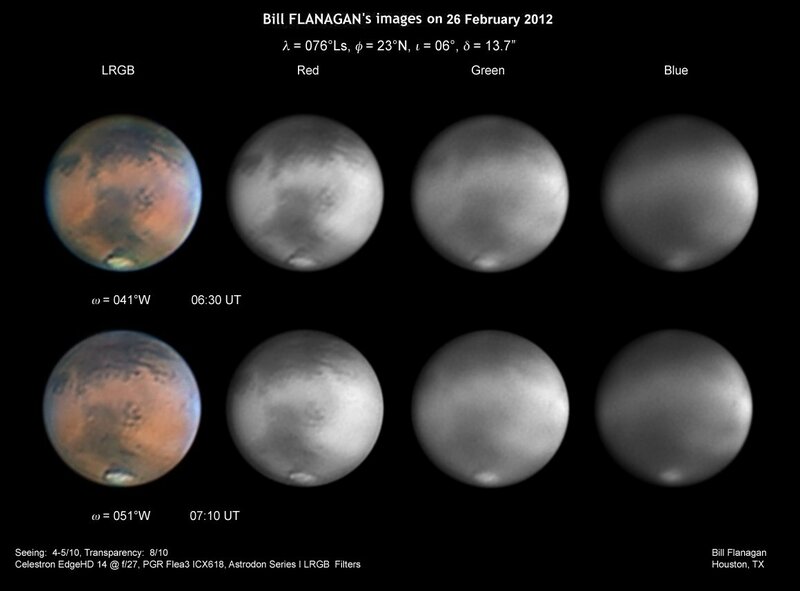 However on the sets of images on 4 Feb (λ=066°Ls) the dust was not definite. 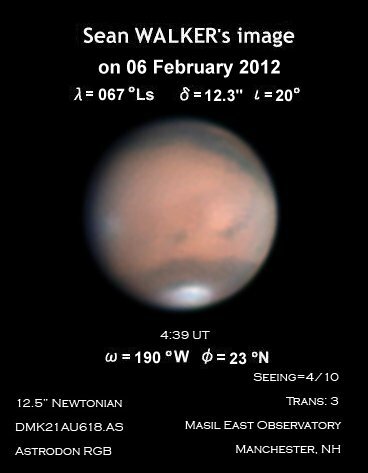 She took also on 7 Feb (λ=067°Ls) at ω=132°W, 140°W°, 151W, 162°W where the dust is clear. Note that she took every 40 minutes at the similar times so that they all are comparable with the before and after day's angles. So we can at least consider that the dust was emerged around on 5 Feb (λ=066°Ls) and continued to 12 Feb (λ=069°Ls): long standing. The place may be near Deucalidonius L. This dust was captured also by Sean WALKER (SWk) on 10 Feb (λ=069°Ls) at ω=161°W, and also by Frank MELILLO (FMl) on the same day at ω=178°W: These are therefore comparable with SKw's images on 5 and 6 Feb (especially SKw took at 162°W, 172°W on 6 Feb). 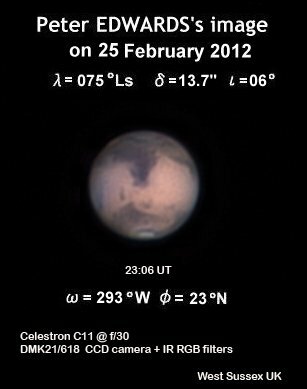 Rima Borealis is evident on the set of images of EMr on 9 Feb (λ=068°Ls) at ω=201°W as a part of the P-ring (defined in CMO #393). 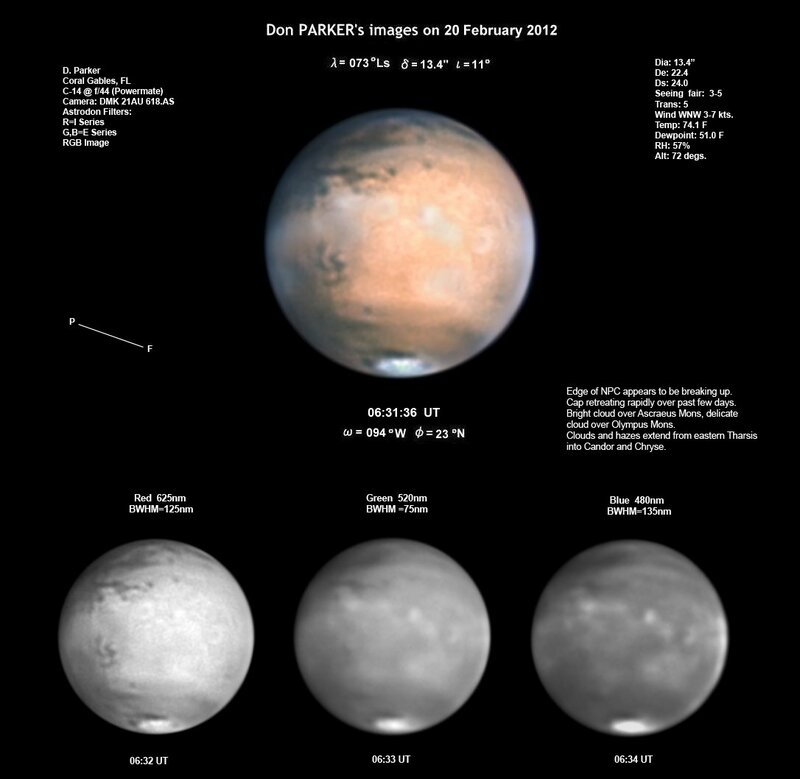 Otherwise, this dust was observed by several observers at the peripheral areas: It is suggested on the image by Sean (SWk) on 6 Feb (λ=067°Ls) at ω=190°W, on the image set by Jean-Jacques POUPEAU (JPp) on 11 Feb (λ=069°Ls) at ω=092°W, and on the image sets by Damian PEACH (DPc) on 12 Feb at ω=086°W, 091°W/093°W and so on. Finally we note that the eastern end of Olympia was slightly disturbed already on 19 Jan (λ=059°Ls) as checked by Freddy WILLEMS (FWl) which is reported in CMO #394 (to be sent out tomorrow by airmail on 16 Feb).